In 7 things I wish people understood about being a teacher, Andrew Simmons captures a few of the things that make teaching so rewarding and so challenging. If you don't understand these truths, you may not understand why anyone would want to teach. You also run the risk of misunderstanding the problems with our education system and thus supporting changes that are unlikely to fix them. Check it out. ... would-be superteachers are smart, sometimes masochistic 23-year-olds working 18-hour days to pump up test scores for a few years before moving on to administrative positions, law school, or nervous breakdowns. They embrace an unsustainable load. I used to wonder why so many good teachers ended up leaving the classroom. One reason is burn-out. Universities burn out researchers and teachers alike by pushing them onto a treadmill, or by letting them get on and stay there of their own volition. Good teaching can happen every year, if we learn how to maintain balance. Everything I learn is filtered through the possibility that it might be taught. When I read that line, I nodded my head silently. This guy really is a teacher. We must ignore the machine manufacturers' spurious claims of security, create tiger teams to test the machines' and systems' resistance to attack, drastically increase their cyber-defenses and take them offline if we can't guarantee their security online. The students in my department love to compete in cyberdefense competitions (CDCs), in which they are charged with setting up various systems and then defending them against attack from experts for some period, say, twenty-four hours. Such competitions are growing in popularity across the country. Maybe we should run a CDC with the tables turned. Manufacturers are required to set up their systems and to run the full set of services they promise when they sell the systems to government agencies. Students across the US would then be given a window of twenty-fours or more to try to crack the systems, with the manufacturers or even our election agencies trying to keep their systems up and running securely. Any vulnerabilities that the students find would be made public, enabling the manufacturers to fix them and the state agencies to create and set up new controls. Great idea or crazy fantasy? Parnas observes: "Professional Engineers rarely use 'engineer' as a verb." And it's not because they are busy 'architecting' systems. The paraphrase comes from Parnas's On ICSE's "Most Influential" Papers, which appears in the July 1995 issue so ACM SIGSOFT's Software Engineering Notes. He wrote that paper in conjunction with his acceptance speech on receiving the Most Influential Paper award at ICSE 17. It's a good read on how the software engineering research community's influence was, at least at that time, limited to other researchers. Parnas asserts that researchers should strive to influence practitioners, the people who are actually writing software. Computer professionals do not read our literature because it does not help them to do their job better. Most of our papers are written in the tradition of science, not engineering. We write up the results of our research for readers who are also researchers, not for practitioners. We base our papers on previous work done by other researchers, and often ignore current practical problems. In many other engineering fields, the results of research are reported in "How to" papers. Our papers are "This is what I did" papers. We describe our work, how our work differs from other people's work, what we will do next, etc. This is quite appropriate for papers directed to other researchers, but it is not what is needed in papers that are intended to influence practitioners. Practitioners are far more interested in being told the basic assumptions behind the work, than in knowing how this work differs from the work by the author's cohorts in the research game. Around the time Parnas wrote this article and gave his acceptance speech at ICSE 17, the Pattern Languages of Programs conferences were taking off, with a similar motivation: to create a literature by and for software practitioners. Patterns describe how to create programs in practical terms. They describe techniques, but also the context in which they work, the forces that make them more and less applicable, and the patterns you can use to address the issues that arise after you the technique. The community encouraged writing in a straightforward style, using the vocabulary of professional developers. At the early PLoP conferences, you could feel the tension between practitioners and academics, some of which grew out of the academic style of writing and the traditions of the scientific literature. I had to learn a lot about how to write for an audience of software developers. Fortunately, the people in the PLoP community took the time to help me get better. I have fond memories of receiving feedback from Frank Buschman, Peter Sommerlad, Ralph Johnson, Ward Cunningham, Kyle Brown, Ken, Auer, and many others. The feedback wasn't always easy to internalize -- it's hard to change! -- but it was necessary. I'm not sure that an appreciably larger number of academics in software engineering and computer science more broadly write for the wider community of software practitioners these days than when Parnas made his remarks. There are certainly more venues available to us from patterns-related conferences, separate tracks at conferences like SPLASH, and blogs. Unfortunately, the academic reward structure isn't always friendly to this kind of writing, especially early in one's career. Some universities have begun to open up their definition of scholarship, though, which creates new opportunities. At their best, software patterns are exactly what Parnas calls for: creating a how-to literature aimed at practitioners. Researchers and practitioners can both participate in this endeavor. Early in Arnold Samuelson's With Hemingway: A Year in Key West and Cuba, Papa is giving an impromptu lecture about writing to two aspiring young writers. (He does that a lot in the book, whenever the men are out sailing and fishing.) This particular lecture was prompted by what he thought was bad advice in a book by a successful pulp fiction author on how to get started as a writer. An earlier session had focused on the shortcomings of going to college to learn how to become a writer. "They ought to have me teach some of those college classes. I could teach them something. Most professors of English composition can tell the students what's wrong with their pieces but they don't know how to make them good, because, if they knew that, they'd be writers themselves and they wouldn't have to teach." "What do you think of the life of a professor?" "All right for a person who is vain and likes to have the adulation of his students. Well, now, do you fellows think you can remember everything Professor Hemingway has told you? Are you prepared for a written examination on the lecture?" Teaching computer science must be different from teaching fiction writing. I have been teaching for quite a few years now and have never received any adulation. Then again, though, I've never experienced much derision either. My students seems to develop a narrower set of emotions. Some seem to like me quite a bit and look for chances to take another course with me. Other students are... indifferent. To them, I'm just the guy standing in the way of them getting to somewhere else they want to be. Hemingway's "have to teach" dig is cliché. Perhaps the Ernest Hemingways and Scott Fitzgeralds of the world should be devoting all of their time to writing, but there have a been any number of excellent authors who have supplemented their incomes and filled the down time between creative bursts by helping other writers find a path for themselves. Samuelson's book itself is a testament to how much Papa loved to share his wisdom and to help newcomers find their footing in a tough business. During all those hours at sea, Hemingway was teaching. Still, I understand what Hemingway means when he speaks of the difference between knowing that something is bad and knowing how to make something good. One of the biggest challenges I faced in my early years as a professor was figuring out how to go beyond pointing out errors and weaknesses in my students' code to giving them concrete advice on how two design and write good programs. I'm still learning how to do that. I'm lucky that I like to write programs myself. Writing code and learning new styles and languages is the only way to stay sharp. Perhaps if I were really good, I'd leave academia and build systems for Google or some hot start-up, as Hemingway would have it. I'm certainly under no illusion that I can simulate that kind of experience working at a university. But I do think a person can both do and teach, and that the best teachers are ones who take both seriously. In computer science, it is a constant challenge to keep up with students who are pushing ahead into a world that keeps changing. The photo above comes from the John F. Kennedy Presidential Library and Museum. 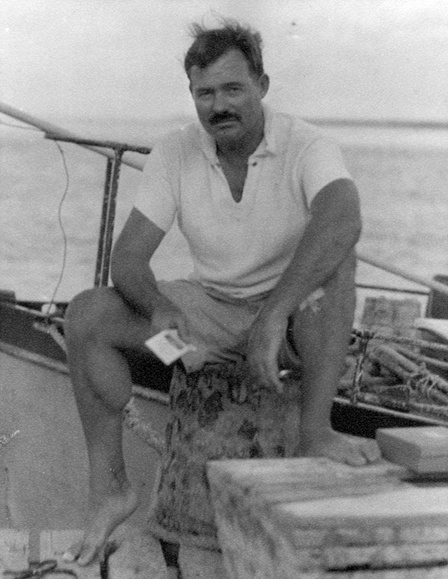 It shows Hemingway sitting on a dock next to his boat, Pilar, sometime in the 1930s. The conversation quoted above took place on the Pilar in 1934. It took two years of hard work and late nights at the whiteboard to build a prototype of something we knew we could be proud of -- and what Silicon Valley investor would agree to fund something that would take two years to release? Not only that, but it would have cost us roughly 6 times as much money to develop it in Silicon Valley -- for no immediate benefit. If moving to Beijing is not an option for you, fear not. You do not have to travel that far to find patient investors, great programmers, and low cost of living. Try Des Moines. Or St. Louis. Or Indianapolis. Or, if you must live in a Major World City, try Chicago. Even my small city can offer a good starting point, though programmers are not as plentiful as we might like. The US Midwest has a lot of advantages for founders, but none of the smog you'll find in Beijing and much shorter commutes than you will find in all the places people tell you you have to go. I've been reading a bunch of the essays on David Chapman's Meaningness website lately, after seeing a link to one on Twitter. (Thanks, @kaledic.) This morning I read How To Think Real Good, about one of Chapman's abandoned projects: a book of advice for how to think and solve problems. He may never write this book as he once imagined it, but I'm glad he wrote this essay about the idea. First of all, it was a fun read, at least for me. Chapman is a former AI researcher, and some of the stories he tells remind me of things I experienced when I was in AI. We were even in school at about the same time, though in different parts of the country and different kinds of program. His work was much more important than mine, but I think at some fundamental level most people in AI share common dreams and goals. It was fun to listen as Chapman reminisced about knowledge and AI. He also introduced me to the dandy portmanteau anvilicious. I keep learning new words! There are so many good ones, and people make up the ones that don't exist already. All problem formulations are "false", because they abstract away details of reality. Solve a simplified version of the problem first. If you can't do even that, you're in trouble. Probability theory is sometimes an excellent way of dealing with uncertainty, but it's not the only way, and sometimes it's a terrible way. He elaborates on the last of these, pointing out that probability theory tends to collapse many different kinds of uncertainty into a single value. This does not work all that well in practice, because different kinds of uncertainty often need to be handles in very different ways. Chapman has a lot to say about probability. This essay was prompted by what he sees as an over-reliance of the rationalist community on a pop version of Bayesianism as its foundation for reasoning. But as an old AI researcher, he knows that an idea can sound good and fail in practice for all sorts of reasons. He has also seen how a computer program can make clear exactly what does and doesn't work. Artificial intelligence has always played a useful role as a reality check on ideas about mind, knowledge, reasoning, and thought. More generally, anyone who writes computer programs knows this, too. You can make ambiguous claims with English sentences, but to write a program you really have to have a precise idea. When you don't have a precise idea, your program itself is a precise formulation of something. Figuring out what that is can be a way of figuring out what you were really thing about in the first place. This is one of the most important lessons college students learn from their intro CS courses. It's an experience that can benefit all students, not just CS majors. Try to figure out how people smarter than you think. Find a teacher who is willing to go meta and explain how a field works, instead of lecturing you on its subject matter. This really is good advice. Subject matter is much easier to come by than deep understanding of how the discipline work, especially in these days of the web. The word meta appears frequently throughout this essay. (I love that the essay is posted on the metablog/ portion of his site!) Chapman's project is thinking about thinking, a step up the ladder of abstraction from "simply" thinking. An AI program must reason; an AI researcher must reason about how to reason. This is the great siren of artificial intelligence, the source of its power and also its weaknesses: Anything you can do, I can do meta. I think this gets at why I enjoyed this essay so much. AI is ultimately the discipline of applied epistemology, and most of us who are lured into AI's arms share an interest in what it means to speak of knowledge. If we really understand knowledge, then we ought to be able to write a computer program that implements that understanding. And if we do, how can we say that our computer program isn't doing essentially the same thing that makes us humans intelligent? As much as I love computer science and programming, my favorite course in graduate school was an epistemology course I took with Prof. Rich Hall. It drove straight to the core curiosity that impelled me to study AI in the first place. In the first week of the course, Prof. Hall laid out the notion of justified true belief, and from there I was hooked. A lot of AI starts with a naive feeling of this sort, whether explicitly stated or not. Doing AI research brings that feeling into contact with reality. Then things gets serious. It's all enormously stimulating. Ultimately Chapman left the field, disillusioned by what he saw as a fundamental limitation that AI's bag of tricks could never resolve. Even so, the questions that led him to AI still motivate him and his current work, which is good for all of us, I think. This essay brought back a lot of pleasant memories for me. Even though I, too, am no longer in AI, the questions that led me to the field still motivate me and my interests in program design, programming languages, software development, and CS education. It is hard to escape the questions of what it means to think and how we can do it better. These remain central problems of what it means to be human. The difficulty is for me to be affirmative. I'm a little inhibited, as you have noticed, by not being against any of these people. The spirit of denunciation is more in the spirit of our time: sensation brought to an extreme. Levine might just as well have been talking about today's social and political climate. Especially if he had had a Facebook or Twitter account. We have a fair number of students on campus outside of CS who want to become web designers, but few of them think they should learn to program. Some give it a try when one of our communications profs tells them how exciting and liberating it can be. In general, though, it's a hard sell. Programming sounds boring to them, full of low-level details better left to techies over in computer science. This issue pervades the web design community. In The Bomb in the Garden, Matthew Butterick does a great job of explaining why the web as a design medium is worth saving, and pointing to ways in which programming can release the creativity we need to keep it alive. Which brings me to my next topic--what should designers know about programming? And I know that some of you will think this is beating a dead horse. But when we talk about restoring creativity to the web, and expanding possibilities, we can't avoid the fact that just like the web is a typographic medium, it's also a programmable medium. You don't have to learn programming, but don't knock it till you try it. It's fun for me when one of the web design students majoring in another department takes his or her first programming class and is sparked by the possibilities that writing a program opens up. And we in CS are happy to help them go deeper into the magic. Butterick speaks truth when he says he's a designer who does a lot of programming in his work. Check out Pollen, the publishing system he created to write web-based books. Pollen's documentation says that it "helps authors make functional and beautiful digital books". That's true. It's a very nice package.